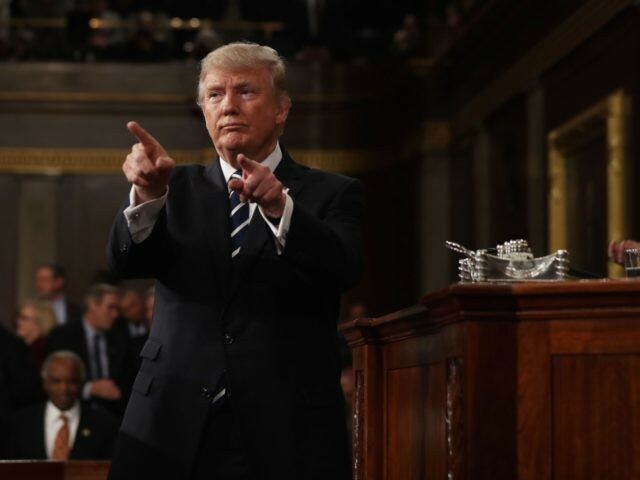 President Donald Trump will deliver the State of the Union address to a special joint session of Congress on Tuesday evening. I canvassed Breitbart editors and reporters, and this is what they believe Trump should say. – The Wall Is Everything, and Democrats Only Oppose It Because of Politics — Not Because They Disagree. Trump will give his speech while Congress is still negotiating over border security — with just ten days left before the Feb. 15 deadline, after which the government will shut down again. A wall — or fence, or physical barrier — would help stop illegal immigration, protect Americans from illegal alien criminals, and preserve the rule of law. It would also help defend the U.S. from the Mexican cartels, and help disrupt the drug trade, which feeds on our people. The president could do that — or he could urge Congress to avoid that by arriving at a common-sense agreement. Either way, he must insist on the importance of the wall. Brandon Darby, who runs our border coverage, told me that Trump should focus on specific cartels on specific stretches of the border — especially the CDN faction of Los Zetas, and the Reynosa Faction of the Gulf Cartel. Trump could quote Democrats’ own words back at them — as he has done in the past — about the importance of stopping illegal crossings at the southern border. He should remind the nation that if not for politics, Democrats would support the wall. Because of a personal fight with him, they are ignoring the experts telling Congress how, and where, to build a barrier at minimal cost to taxpayers. He should call on them to put national security first. The economy is going so insanely well that it is hard to quantify — though a few figures tell the tale: 304,000 new jobs created last month, despite a government shutdown; economic growth around 3 percent, when the previous administration told us that the days of rapid growth were over; and the best January stock market in 30 years. Americans were warned that new tariffs — especially on China — in response to unfair foreign trading practices would consumers by raising prices. But prices have remained flat, allowing the Federal Reserve to ease off its interest rate hikes. And the federal government has helped American farmers endure our rivals’ retaliation. No one predicted, at the outset of our “trade war” with China, that the U.S. economy would be soaring and that China’s economy would be stumbling. Yet that is exactly what has happened. That does not mean raising tariffs always works — but the Trump administration is taking advantage of a strong U.S. economy to reset trade relations. Gas prices are also low — thanks, in part, to the energy boom in the U.S., which last year surpassed Saudi Arabia to become the world’s top crude oil producer. And that boom is also bringing cleaner-burning natural gas online. Housing prices stumbled late last year, but have recovered — as has the stock market, which is strong again. Breitbart News’ financial editor John Carney told me Trump’s message should be simple: “Job creation is amazing.” He could also urge more American companies to keep operations in the U.S. Perhaps Trump should tell General Motors, which is cutting U.S. jobs this week, should start building its Envision SUVs in the United States, he said. The Democrats are eager to pass laws at the state level to allow abortion right up to — and perhaps beyond — the moment a baby is delivered. That presents an opportunity for Trump to respond with a message of moral clarity on the issue — especially after recent events in Virginia, where the governor — now struggling to hang onto his job in a bizarre racial scandal — seemed, at least to some who heard him, to justify infanticide last week. Demcorats’ first bill in the House, H.R. 1, calls for changes to election laws. Trump should remind his opponents that the biggest threat to democracy is not in Washington, but in Silicon Valley. When Trump called out Google and other tech companies for censorship, the mainstream media accused him of being a conspiracy theorist. Yet Breitbart’s scoops validated the president’s position, revealing that Google’s own internal research describes the tech giant’s actions as censorship, and that YouTube and Google regularly manipulate political search results, including the suppression pro-life content in search results for “abortion.” One of Google’s own engineers called the manipulation of search results for abortion a “smoking gun” that proved political censorship. Broad point: how can Americans trust the democratic process when the modern-day gatekeepers of information in Silicon Valley abuse their position? Facebook mass-banned alternative media right before the midterms, and even banned Trump’s own election ad along with other Republican ads. Google tried to boost turnout in pro-Democrat demographics in 2016, and, absent any oversight, has the potential to swing any election of its choosing with no paper trail. Social media platforms are adjusting their algorithms to favor the fake news media regularly called out by President Trump, while suppressing alternative media that support the MAGA agenda. They’re also funneling money to them — Google will invest $300 million in mainstream news, and Facebook is also funding a host of programming from mainstream broadcasters. President Trump could send a shot across Silicon Valley’s bow by taking on the tech giants from the podium. The new Democrat-run House of Representatives is stacked with “democratic socialists” — who somehow fail to see that their ideology is failing, once again, in Venezuela, which was once the richest nation in Latin America. Breitbart News’ foreign policy editors and reporters are optimistic about the prospects for a post-Nicolas Maduro Venezuela. National security reporter Ben Kew, who has been to Venezuela several times, told me: “I think Trump should make reference to how Latin American’s left-wing ‘Pink Tide’ has finally crashed. Nowadays, the continent is governed by steadfast conservative allies, particularly Brazil, Colombia, Chile, and Argentina. “Now it’s time for Maduro to go and Venezuela can join them,” he added. Far from retreating from the world stage, the U.S. is leading. In addition to Venezuela, where President Trump was the first to recognize opposition leader Juan Guaidó as the country’s interim president, leading many other nations to follow, the U.S. has also led the way by recognizing Jerusalem as Israel’s capital and moving our embassy there. Several other nations have followed suit in one form or another. Last year’s summit with North Korean leader Kim Jong-un opened up the possibility of peaceful denuclearization, and while the road to an acceptable final deal will be difficult, another summit is planned for later this month. President Trump also continues to stand up to China and Russia. Last week, the administration announced that the U.S. is pulling out of the Intermediate-Range Nuclear Forces Treaty due to Russian violations. And NATO agreed. So much for the Democrats’ “collusion” narrative. The president will also likely make the case that the U.S. should bring troops home from Syria and Afghanistan — reserving the possibility of returning if terror does. Finally, the president could tout the success of his policies on Iran. Pulling out of the nuclear deal has not made the regime stronger: quite the opposite. Iran’s economy is collapsing — and the regime is blaming Trump. He should proudly take the credit.